← Media Release: Logging of World Heritage nominated forest in the Tyenna halted by peaceful protest. 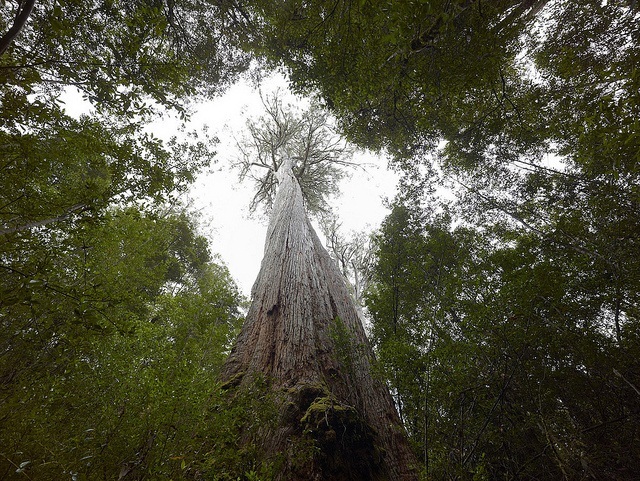 The Legislative Council has fired a torpedo into the Tasmanian Forest Agreement. After the Agreement was struck last year the Prime Minister, Julia Gillard, made it clear that she expected it to be implemented without alteration. In perhaps the biggest downpayment in Tasmanian history, the Commonwealth gave $120 million to the collapsed logging industry to make good the Agreement. It promised over $100 million more for regional development on condition that the Agreement was fully implemented, including its promised forest reserves. However, here in Tasmania, under concerted fire from the Liberals and disgruntled individuals from the logging industry, the Legislative Council has voted to amend the enabling legislation which was passed by the House of Assembly and blown up the Agreement’s environmental outcome. The Council’s amendments leave the loggers’ interests wholly intact while putting the bulk of the environmentalists’ outcomes on the never-never. The Agreement’s promise of immediate and permanent reserves in return for the hundreds of millions of dollars in industry restructure, retraining and regional development is largely broken. Gazetting of the majority of the promised national parks would be delayed until, if the polls are right, Liberal governments are voted into both Canberra and Hobart. The Liberals have campaigned against the forest peace agreement all the way down the line. Ignoring the fact that it is industry and environment groups which have spent three years negotiating the agreement, not Labor or the Greens, Liberal spokesman Peter Gutwein asserted after the Council vote that ” we will unlock every single stick that Labor and the Greens try to lock up”. Legislative Councillor and Liberal Party member Tony Mulder, who sealed the Council’s amendments, emailed one logging campaigner to reveal his plan was to ‘get some fed dollars’ and then watch the deal fall over. He wrote that he intended to put the reserves ‘to the sword’. Key to this hostile game plan played out by the Council amendments is sinking the core commitment in the Agreement that “the Signatories support the legally binding protection of an additional 504,012 hectares of native forests’, with 395,199 hectares given legislative protection ‘as soon as feasible’. That is, this year. Three of the many Council amendments to the legislation highlight their killer effect. Firstly, after interim protection, some 300,000 of those 395,199 hectares of High Conservation Value forests to be reserved ‘as soon as feasible’ have had that reservation put off until at least October 2014. That means the Liberals, if they win the elections, will put the promised reserves ‘to the sword’. Even if the Liberals stay in opposition, the reserves fail if there are any substantial protests in a state where forest destruction and protests have occurred every year since the 1970s. To make sure, the reserves also fail if Forestry Tasmania, which has been refused green accreditation for years, is not given Forest Stewardship Council certification by the mainland-based authority. Secondly, of the 123,000 hectares of top order forests, like the Styx, Huon, Weld and Upper Florentine, which were nominated by the federal and state governments for World Heritage status last February, a Council amendment removes 35,000 hectares near Cradle Mountain and in the Great Western Tiers from gaining national park status unless both the nomination succeeds and that green accreditation is granted to Forestry Tasmania. Another Council amendment to the Agreement is that any reserve, including in the World Heritage Area, could be logged for special species timber, as defined by the minister of the day, if this is deemed necessary in the future. In a nutshell, the Tasmanian Forest Agreement’s fundamental deal that 395,199 hectares of High Conservation Value forest reserves, ostensibly national parks, should be created in return for the hundreds of millions of dollars of industry and regional restructuring is being torpedoed. The logging industry employs fewer than 2,000 and that number is falling. Tourism employs more than 15,000 and that number is growing. The Council’s perverse action, if allowed to stand, will mean that the former has its money while the latter is left with neither vital new forest attractions nor the regional development funds it should share in creating Tasmania’s new future. This puts governments in both Canberra and Hobart to the test. The House of Assembly should return the original legislation to the Council. If the Council insists on its amendments let history, as well as contemporary Tasmanian voters, see it for the wrecker it has become. Bob Brown is the former Leader of the Australian Greens, and a Director of Markets For Change. Posted on April 27, 2013, in Guest Blog. Bookmark the permalink. 3 Comments. Bob Brown you have delivered a potent yet clearly understandable appraisal of the ratbaggery still being engaged in by today’s longer serving State political incumbents, your blog commentary here sums up all of the nonsensical arbitrary speculations from the Ancient Forest destroying brain-washed logging elements rife throughout Tasmania. I dare say that this convoluted hocus-pocus switch-around by Tasmania’s incorrigible obfuscating lighter-minded ministers will create in the mind of our prime Minister, the desire to sell-off this Tasmanian part of Australia and at a discount rate to those oily and avaricious corrupting Asian Billionaires dwelling almost to the North of our Mainland shores. It never fails to amaze me how a small handful of people (2000 out of 500,000 +) can drive a wrecking ball into the Tasmanian economy, time after time. A decaying and archaic logging industry, which carries echoes of earlier centuries and obsolete practices, still will not move forward. Four giant companies have failed, Forestry Tasmania, is being propped up by the taxpayer, due to insolvency and still the bawling for a return to the good old days overpowers the birdsong in our forests. Wake up! Move on! There are better, more sustainable ways to make business and create jobs. Other countries made the change decades ago and it is time we did likewise. This is just utter soul destroying swindling yet again all in the name of outdated destruction and trade in vital forests that should have been protected eons ago. And now massive ‘back burning’ has started in Tasmania. I’ve seen the smoke screens rising in the North East, massive tracks of deliberate bush burning, why? And what about the wildlife in these areas and the air pollution this is causing? Madness to the point of ecocide! Logging of Temperate Old Growth forests seems like an uncurable addiction. Going back to the old days? Old ways? Like sacrificing more men soldiers just so we can keep glorifying war in the future with commemorations and outpourings of grief and loss? While the forests keep falling and global warming records are the highest in 3 million years! This is a criminal development and many of these forest agreement saboteurs should stand trial in an international court acused of ecocide! My patience and tolerance have run out!